Presidental candidate Jared Ginsburg said he plans to file an elections complaint that the official Facebook page for Undergraduate Student Government was hacked during voting for USG elections. USG officials said at around 5:30 p.m. that a hack did occur, but said at 11 p.m. that they could neither confirm nor deny a hack. “No one from [USG] communications or technology posted [the status] so we cannot confirm that they actually ever appeared on the page,” said Sabena Suri, USG senior director of communications. 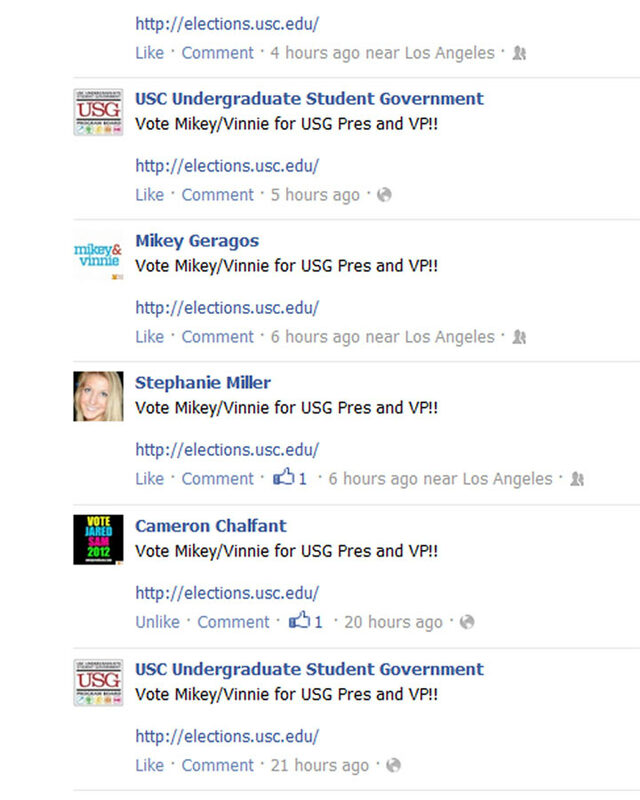 Statuses allegedly appeared on the USG page urging followers to vote for the presidential ticket of Mikey Geragos and Vinnie Prasad, according to screenshots taken by Ginsburg. The hacks were discovered around 3:45 p.m. Wednesday, Ginsburg said. The Facebook accounts of students who publicly supported Ginsburg’s campaign also posted the same status supporting Geragos and Prasad, Ginsburg said. Suri said USG’s communication and technology team determined no USG members had posted the comments on the page. USG members and programs cannot endorse or support a specific candidate, according to article IX, section D of the USG elections code. Ginsburg said Wednesday night that his campaign is planning to file an official election complaint Thursday morning. After a complaint is filed, an election commission comprised of five students would have 24 hours to review the case and decide whether to proceed or dismiss the case. If they choose to hear the case, the commission would have 24 hours to make a ruling. A video of the commission meeting would be released the next day. “The election commission is responsible for coming up with any and all punishments and repercussions for any action that is brought before them,” said Elise Fabbro, USG co-director of elections and recruitment. Geragos said his campaign was not involved with the Facebook hacks. Geragos said his research found that the allegedly hacked statuses of individual Facebook users showed the same location and time stamps as election-related statuses that were posted on the hacking victim’s walls. Ginsburg said his campaign was investigating the incident by contacting Facebook and the hack victims before filing an official complaint. According to the screenshot, the first update from USG’s page supporting Geragos’ ticket was posted at about 7 p.m., 21 hours before the screenshots were taken. “It has been [up for] almost a full day of the voting period, and USG has several hundred, if not a thousand, followers who may have seen that post and thus had their vote influenced one way or another,” Ginsburg said. USG has nearly 1,500 followers on Facebook. Voting ends Thursday and preliminary results will be released Feb. 21. The official results will be announced the following week. Anyone who is friends with Mikey on Facebook can attest–there is no status that looks like this on his page. Even if he was hacked (and he says he wasn’t), why would he have deleted a post that supports his own campaign? Something sounds fishy–there are websites that do exactly what is shown in the screenshot: they can change a status to say one thing in a photo, but they do not appear on Facebook itself. We get it, you’re bitter, Greek. Not every Mikey/Vinnie supporter is a Sigma Chi… or even in the greek system. While running for a similar position in high school, the signs/ campaign material of one of Mikey’s opponents also mysteriously disappeared. Now his largest competition is arguably at a disadvantage because of a similar instance, in addition to these Facebook hacking allegations, which Mikey probably also didn’t do himself, but someone in his camp probably executed. And if I’m not mistaken, Mikey’s responsible for these action’s according to some USC code. As for the security of Facebook, for anyone not familiar with comp-sci, it is astoundingly not difficult to hack someone’s Facebook. Jared clearly appears like front-runner and it seems like, (in my opinion), Mikey’s a bit sleazy. Hahaha. No he is not. Learn your laws. Read up, seriously! Do you go to UCLA? It’s amazing you can post this BS. Why don’t you contact Mikey’s high school opponent yourself and get the facts before you make your stupid allegations. He never did anything like you are mentioning. Running to the Daily Trojan and continually trying to smear ones opponent is what truly constitutes sleazy. Get your facts. If you’re trying to dig up dirt on Mikey from his high school days, I have one word for you: Weinergate. Did anyone else just get spammed by the Jared/Sam campaign with instructions on how to vote for them? 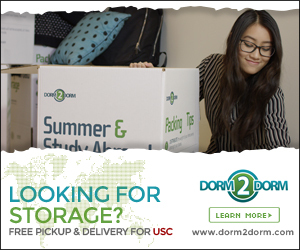 How did they get access to all the student addresses at usc? yep happened to me too. ignored it at the time but this reminded me. not sure how they got my personal email. subject:	2 HOURS LEFT: Vote Jared & Sam for USG President and VP!! 3. VOTE JARED & SAM FOR USG PRESIDENT & VICE PRESIDENT! I got spammed by them too. Except it was even spammier – it came from someone’s USC email and had the subject “hey how are you?”. so shady. 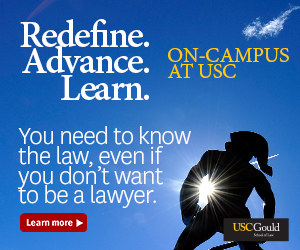 Why are you reading the daily trojan or following this campaign? YOU ARE NOT AN UNDERGRAD. Haha, why’d you even bother to comment if you are living your life? It seems unrealistic that every person posting about these candidates would use two exclamation points and the exact same style. Every post I’ve seen regarding candidates varies the way they urge people to vote. It looks like Photoshop to me. Guys… this is all over a popularity contest… please invest your passion and anger over real issues. I’m not in support of any of the parties.. 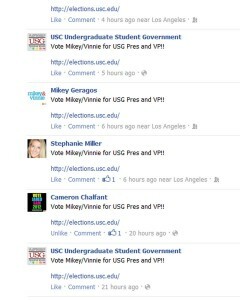 I honestly don’t think the winner of this election will change USC regardless. I’m only posting because i think its HILARIOUS that some people think there is no possibility this was photoshopped…. I could personally photoshop something like this in less than 10 minutes. Not saying he did… but it is defiantly an easy process and everyone who says “a picture is proof” has no idea what my skills are anyone who has played around with the program for 20 minutes can do. Best of luck to the three tickets. A few commenters say that people have seen the screenshots. But how did no one see any of the statuses on actual Facebook for 21 hours???? It’s Facebook. People are on it all day and after 21 hours no one noticed a problem. It seems to me there probably was not one…..
None of these quotes are taken out of context. YOU are the bully. Bullies share their opinions by using hurtful language. Before you make accusations check your self. One of the alleged status hacks was mine, I wrote on my status to vote mikey, he did not hack it. and i say again, VOTE MIKEY FOR USG PRES. None of us know what is going on so everyone needs to shut up. Let the candidates figure it out for themselves. No one would photoshop this. As if anyone has the time. None of the complaints filed are “bogus.” everyone deserves the right to file. Because someone is victimized, they should just shut up and not confront the issue? GO FOCUS ON CLASS because none of you are in USG so none of you know what you are talking about. Americathefree, I am not greek, I am not voting for anyone, hell I am a graduate student. But if you are going to post a comment accusing people of bullying and “spewing venom” you should do it using proper English. A few pieces of advice: 1. You mean to say “voters” not votes, votes dont talk. 2. ashame and a shame are not the same thing, look it up. 3. Squeeze in a few commas instead of ands. Once you have changed these things your comment will approach a C level writing 140 paper. So true. Way to trash around the reputation of USC. Teeheehee, Grammar Police. And I apologize for any grammar mistakes I may have made myself. Thanks for the heads up. I’ll proofread. I don’t think it is fair to form staunch opinions either way for now. The situation is far from clear and is very complex, and the hearing should allow us in the public a better view of what happened. That being said, I do see how sketchy this looks for Jared. I mean, I think that the only was this should EVER be ruled on is if others (NEUTRAL others) claim to have seen the posts as well. If, as Ginsburg suggested, they were us all day then it will be nearly impossible to NOT find someone who has seen them. If not though, I find myself thinking about how easy Photoshop is…. If Jared’s complaint is legit, then fair enough. If we are to find out it isn’t though, I feel as though THEY should receive some punishment, as their continual accusations have ultimately hurt Mikey and Vinnie as well as Theo and Julia. Clearly another bully on Mikey’s pulpit pretending to be fair. Mikey broke rules, lied and cheated whether he himself or his supporters/frat bros. A photo is evidence of the hacked page. No one makes up a photo. There were 4 people in the room that saw the same hacked page up on line. Mikey is a cheater hiding behind his shameful frat bros at worst or ignorant campaign supporters at best. Its like men who hate women, guys who say a woman wanted to be raped, that she did it to herself. Well, Mikey chose to steal and lie, then say his opponents did it. Pleeezzzz, we are informed, smart citizens who smell a rat. Hell, I’m a photographer. Dude, people get PAID TO PHOTOSHOP. WTF? CONSPIRACY? I WROTE IN HERMAN CAIN. You make all of these comments about “frat bros” so why do you never acknowledge that both Sam and Jared are members of the Greek community? Why do you not attack the fact that a large part of their campaign emphasized the fact that they were “the only greek ticket?” It seems unfair to bash Mikey because he is in a frat,but not do the same to Jared and Sam. Here are Mikey’s frat bros spewing venom and bullying. Shame on you little boys.It is clear you are scared and doing whatever bullying and stealing and cheating things you can get away with. But, the votes are not stupid. Follow the money…who benefits from stealing a candidates signs (their opponent, Mikey to say it specifically). Who benefits from hacking into an authorized university website (and the FB page photographed) promoting to vote for a candidate named in the hack (Mikey again)…oops..Mikey and his frat boys give Greeks a bad name. Its ashame that your are endorsed by two sleazy frat houses. It is clear the other candidates are running a clean, honorable campaign based on a solid, well thought out platform. You can’t lie and cheat and bully your way out of this with your lies and cover ups. Go back to your silly video you raced to put up in the last couple days. Ya, rap your way out of this one. This article seems to demonstrate that Jared made this up. All these USG people who had hacked statuses that were up 21 hours and not one of them checked Facebook and saw them? None of them got any notifications? Why can’t anyone in USG confirm this if it happened? If Mikey can hack Facebook, change everyone’s status without them knowing, then get everyone to not check their own Facebook for 21 hours. Then face it, he is either the Napster or Chuck Norris in which case you won’t beat him anyways….. I would obviously deny the fact too if this happened to my campaign. This is a bogus complain by two Sam and Jared. First the signs now hacking. I think running around making accusations speaks to the characters of Sam and Jared. Implying that other candidates were involved is even worst. Anyone that knows Theo and Julia and Mikey and Vinnie knows that they are all honest, hardworking, and committed students. Jared will never be able to contact Facebook, Facebook does not care for bogus complains. As for the comments above I would like to ask supporters of Sam and Jared (few as they are) to not troll this article and use their time in a different and more productive way. It is called standing up to bullies. I call on every person whether gay, straight, woman, man, black, brown, yellow, white, christian, jew, muslim…whoever is attacked by bullies to stand up to them and not be intimidated. The big frat boy mentality gives USC a bad name so Mikey’s frat bros need to go back under the rock from which they came. You don’t have ANYTHING better to do right now? Bogus? Having $1000 worth of signs stolen is bogus? Do you even know that that money comes out of their pocket? It is not bogus. You will feel stupid once the evidence is posted on the daily trojan. Mikey, you should feel ashamed of yourself. You are blatantly lying and have been since day one. I feel bad for Vinnie because he does not deserve this. In high school you stole signs, anything you could do to cheat your way to the top. We all know you are a manipulative liar. Too bad it is just coming out now on the last day of elections how unworthy you are of representing the school. At the end of his high school commencement he goes “Sorry I did not do anything”… is that what USC wants as a president? Since you’re claiming that Mikey is a liar, do you have any proof of Mikey stealing signs in high school or do you have a copy of his commencement speech to prove that you aren’t lying yourself? Shame on you Mikey. Resorting to stealing signs and hacking the USG facebook for self-promotion, you and your frat bros and campaign supporters have no moral compass and are not worthy of representing the 16,000 student undergraduates. Who do you think you are to lie and cheat to win an election? Students here know what you did in your high school election, hmmm where opponents signs disappeared. People have your number Mikey. You can’t hide behind your big frat bros any more. 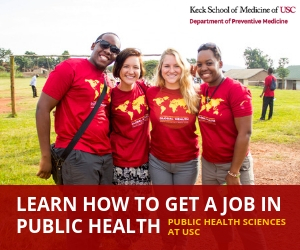 USC is a world class educational institution. Look at you. Come on people, can’t we just all get along?